The first wooden structure built in San Juan Capistrano is the Congdon House. Exact date of construction is not known, but I've references to 1876, 1877, and 1878. It was built by Joel Rathburn Congdon, who is credited with introducing cultivation of the English Walnut into Orange County agriculture. During the old years of OCThen, my friend John and I were priviledged to witness the renovation of the Congdon House. Renovation started in September of 2000. 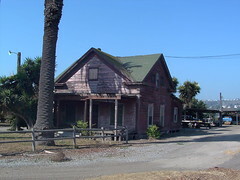 Chase P. Christopher was hired by the City of San Juan Capistrano to renovate the Congdon House. He allowed John and I to take a tour of the home, and provided us with information on its history, and unique features.